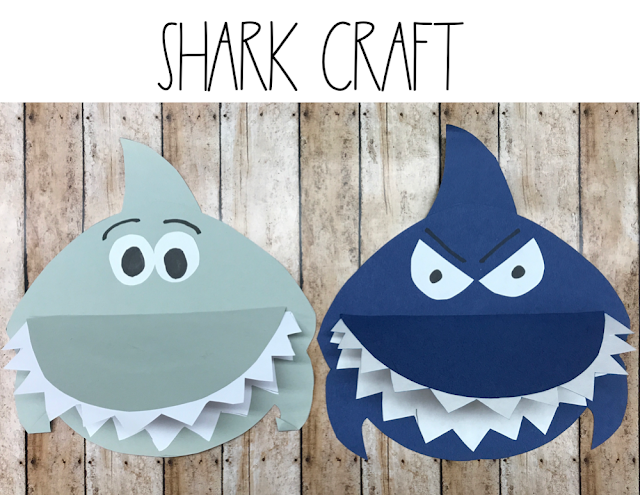 Shark Unit CHOMP! 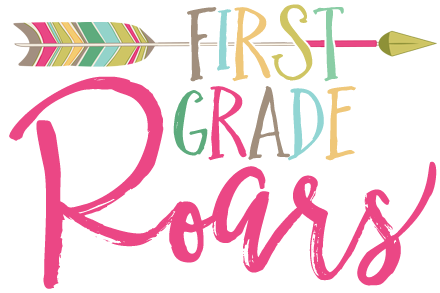 - First Grade Roars! 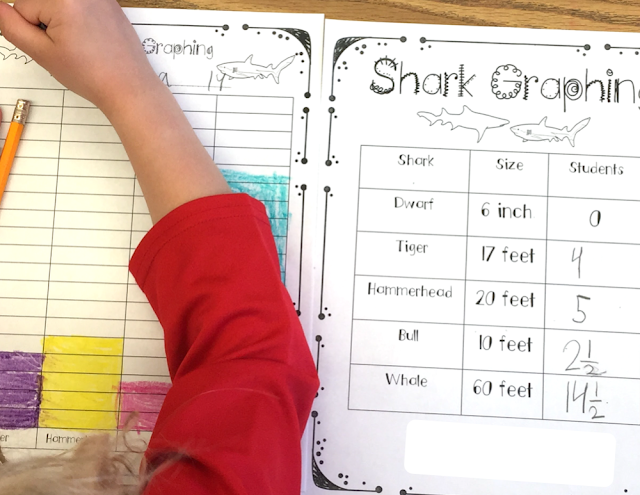 Every year after Spring Break, it has been a tradition to teach my first graders about sharks. It all started 17 years ago when I had zero resources to use in my classroom due to our building closing from a mold. We were displaced to a local church that was kind enough to take us in. It was my first year transitioning from 4th grade to 1st grade, and I literally had nothing. So, I looked at the standards and asked my first graders what they wanted to learn about. That is how this shark unit was born. It has of course grown, just like every other unit of mine, but the joy it brings my students hasn't changed a bit. These animals are fascinating and a bit scary. (Which is why I don't teach it before Spring Break). Here are my favorite books to share with my class. I like to have a paper pencil book as you can see above so we can really dig into the non-fiction text features. Then we just build on our learning from story to story. 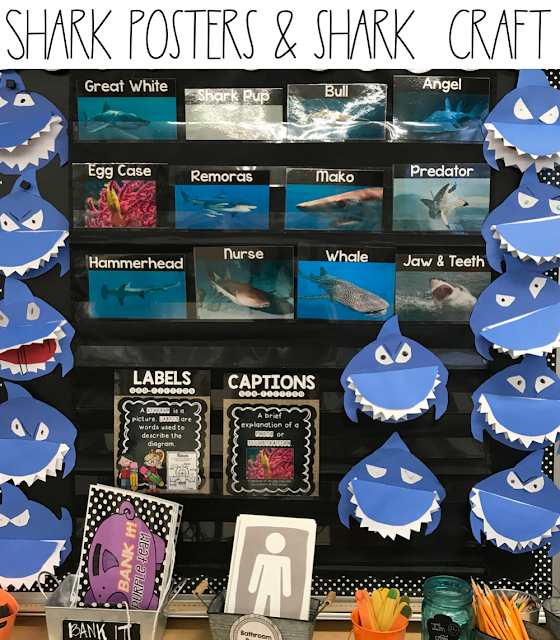 This is part of Guided Reading with a Purpose Series Week 32. 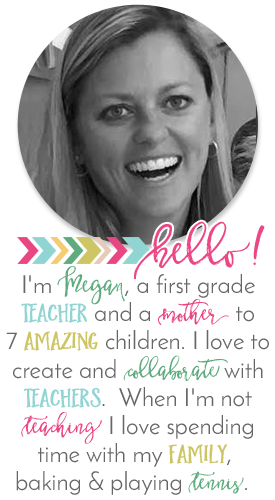 Our focus for the week is captions and labels. So with each story shared, we do discuss and work on these specific features among many other things. 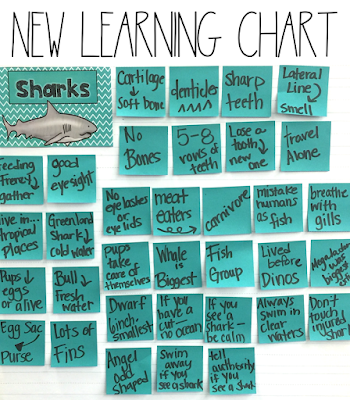 With every non-fiction unit I teach, I love to have some sort of interactive anchor chart. Here are just a few of the ones I have used in the past. Not only do these build each day, but they also provide a place for my students to go and visit when needed throughout the week. In this picture, you can see my two focus strategies, captions and labels. I also have some real shark photographs for my students to refer to. Here is a photo of just some of the things we do during the week. There favorite is the Non-fiction text feature checklist. We use the mini book and dig through it with our highlighter and pencils. They learn so much being able to circle and highlight in the book. 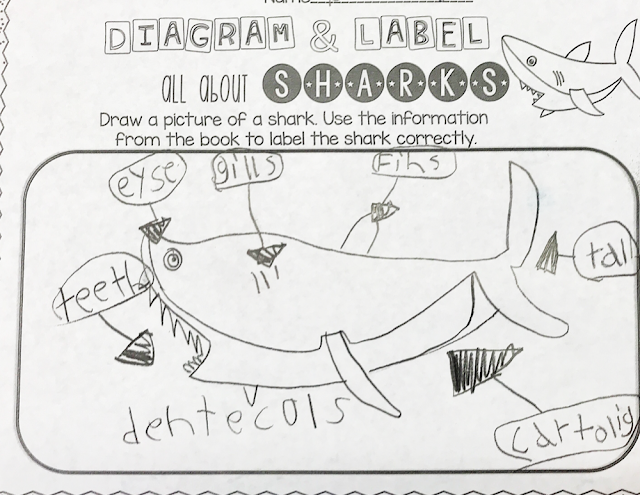 Here is a picture of a diagram and label from last year. 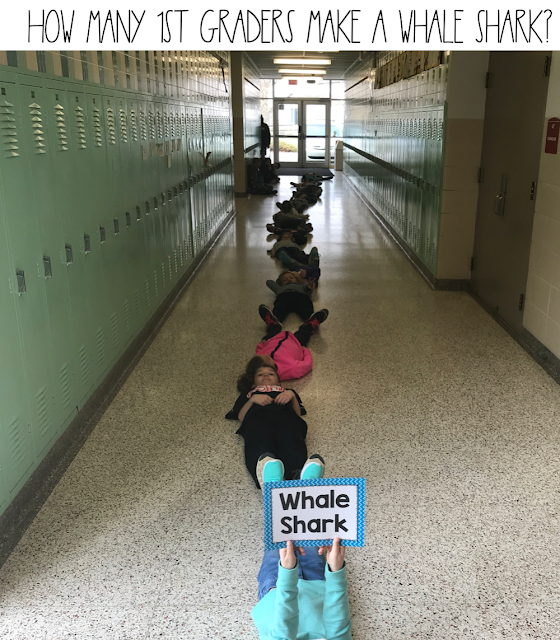 This is an activity we did after reading All about Sharks. When working on captions, we draw a picture from the story and write a short 1-2 sentence description of our picture. 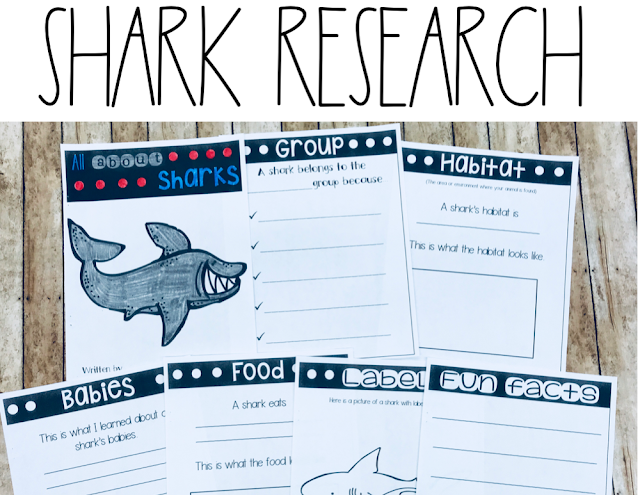 This is the first time we complete a research project on an animal, so we do it all together. Each day we work on a page during writing. 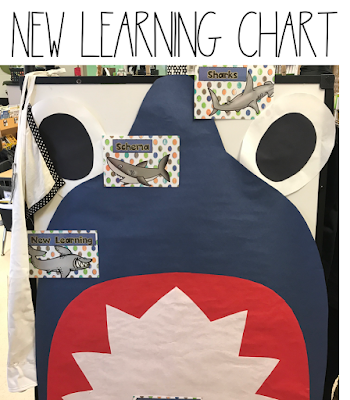 This is an activity that we will do throughout all of our animal group units so I love doing it whole group first. 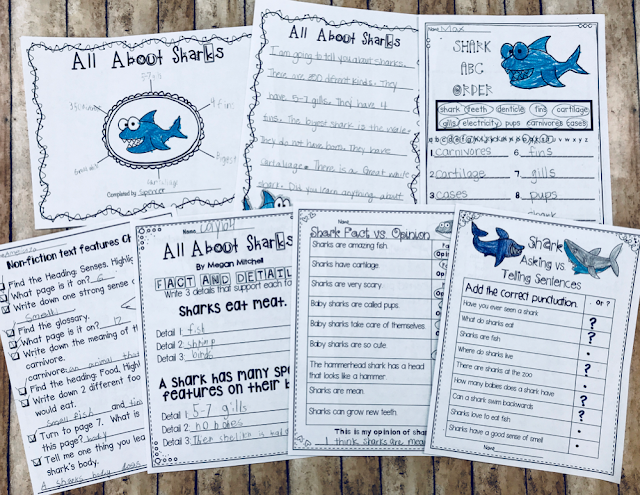 When we are finished at the end of the week, they have an awesome shark report! This shark unit wouldn't be complete without a little fun. 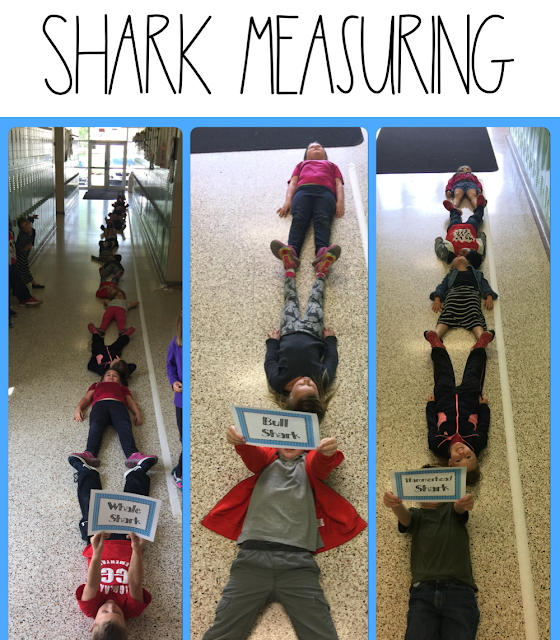 At the end of the week, we measure 4 different sharks using 1st graders. 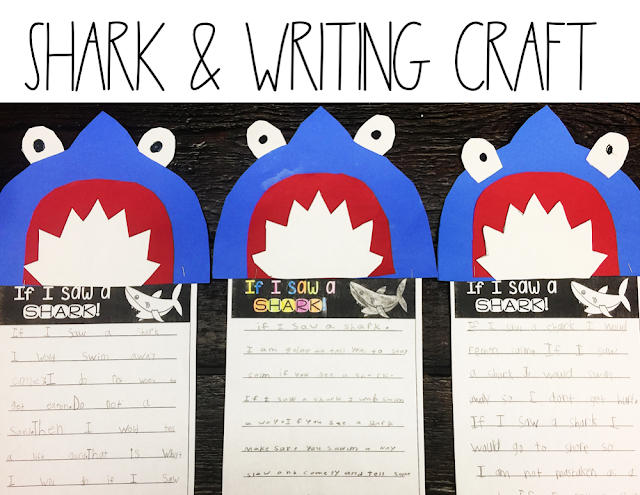 Last year I got smart and used a tape measure and blue tape to mark the length of each shark. (Previously I was using calculator tape that I had to roll up year after year) Then we laid first graders in between the two tape lines to see how many first graders it takes to make each one. You should hear their excitement when we do the whale shark. It is almost hard to imagine the animal being that size. Here is what we do with the information. You can see the calculator tape here! Finally, we end the unit with a craft. I usually switch it up from year to year because there are two different options. 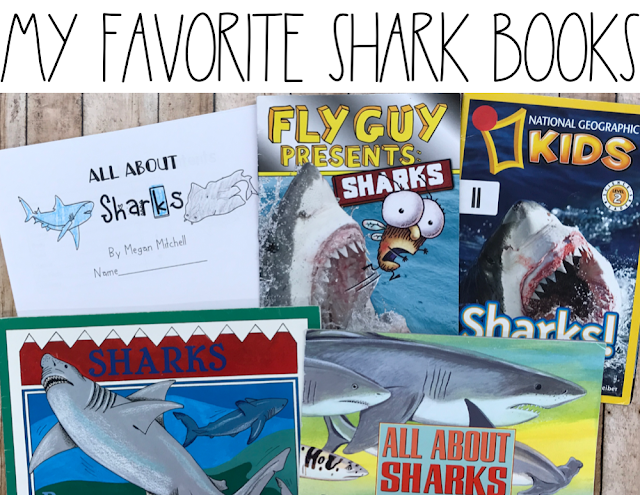 If you are looking for a great non-fiction unit that your students will love, I can promise you this shark one will do it. Lions, Hippos, Giraffes, Oh My! The Three Little Pigs Product Update! Day 2... Dr. Seuss 5 Day Freebie: Green Eggs and Ham!